A form of extra-sensory perception in which someone acquires information by accessing psychic knowledge by means of the physical sense of smelling. 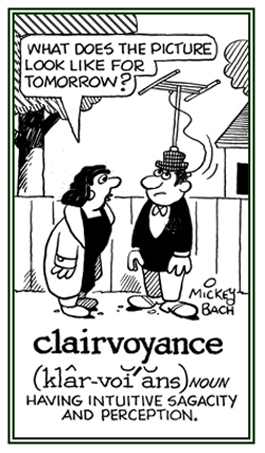 The perceived power to hear sounds said to exist beyond the reach of ordinary experiences or normal abilities: The fortune teller, or clairvoyant, claimed that she could hear the voice of Jim's departed father and that her clairaudience included his best wishes for Jim and his family. © ALL rights are reserved. Descriptive of the supposed powers that someone has to hear things beyond the range of physical perceptions. The ability to hear sounds not actually present; such as, spirit communications, etc. A reference to the power, or faculty, of hearing or perceiving something which is not present to the physical ears but regarded as having objective realities. A paranormal or extrasensory perception that goes beyond the normal physical means of obtaining information about one's surroundings by using faculties other than vision, touching, or hearing: Madam Alison asked her visitors to be very quiet so she can be aware of the clairsentience while she is seeking answers to the puzzling questions presented during her seance or communication with the spirits. 1. The supposed ability to view, or to look at, something that is normally over and above the possibilities of human awareness: Joseph claimed to have clairvoyance which consisted of acute perceptions and intuitive insights for people in their present existence and for the future. 2. 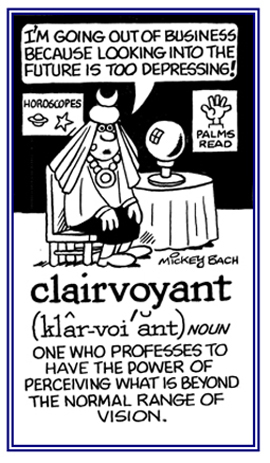 Etymology: from French clairvoyant, "clear-sighted"; from voyant, present participle of voir, "see". © ALL rights are reserved. Someone who is said to be able to perceive, or to see, things that are usually beyond the range of human senses: As a clairvoyant, Eve surprised most of her customers with her ability to explain what would happen if they made certain decisions. © ALL rights are reserved. 1. A reference to or relating to the ability to see that which can't be normally perceived with the normal senses: Roy certainly had a clairvoyant ability to predict his sister's future with her husband because he said that she was going to have four children and sure enough, she had quadruplets! 2. 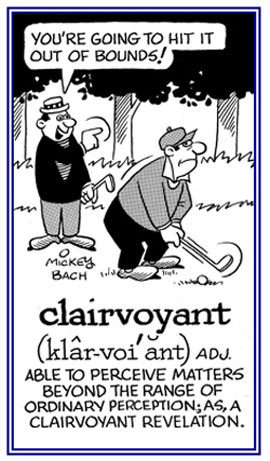 Etymology: from Latin clarus, "clear" + voyant, videre, "to see". © ALL rights are reserved. A reference to someone who is supposedly able to see beyond the range of ordinary physical perceptions: Abraham clairvoyantly predicted what would happen to everyone on a certain aircraft after it flew a distance from the airport.